Appy Pie Help Creating, Updating, Deleting Your App How to integrate Estimote Beacon with Appy Pie App? Every Estimote Beacon ships with an unique ID that you are free to modify. By default, the beacon’s ID is in iBeacon format and consists of three values: UUID, Major and Minor. Beacons broadcast their iBeacon ID, which can then be recognized by mobile apps to trigger specific actions. UUID is fixed, Major and Minor are randomized. It's also possible to switch between iBeacon and Eddystone formats. When using Eddystone, a beacon is no longer broadcasting UUID, Major, and Minor values. They’re replaced either with Eddystone-UID (consisting of Namespace and Instance values) or Eddystone-URL (consisting of a URL address). To better understand the difference between iBeacon and Eddystone, visit our Developer Portal. 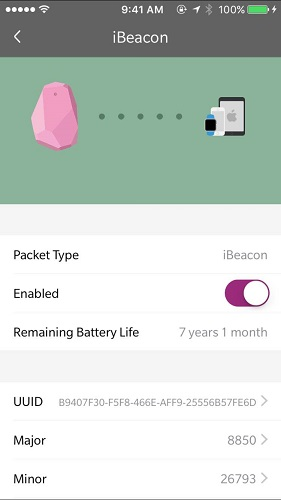 How to change a beacon's ID using Estimote SDK? You can also change iBeacon ID with Estimote SDK. Use the ESTBeaconConnection class (http://estimote.github.io/iOS-SDK/Classes/ESTBeaconConnection.html ) to do that. Note: Initially you can fill 1,1 as the value of Major and Minor. Step 5: Click on the Settings from the Right-Most-Corner. 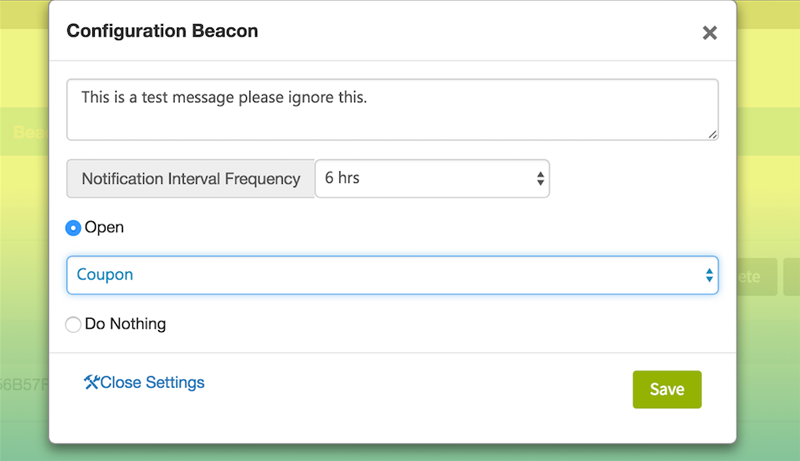 Step 6: Now Configuration Beacon option will open. There you can write your message which will be delivered to your App Users. Step 7: From Advanced Setting section you can manage your Notification Interval Frequency and which action (opening page or do nothing) to be perform.